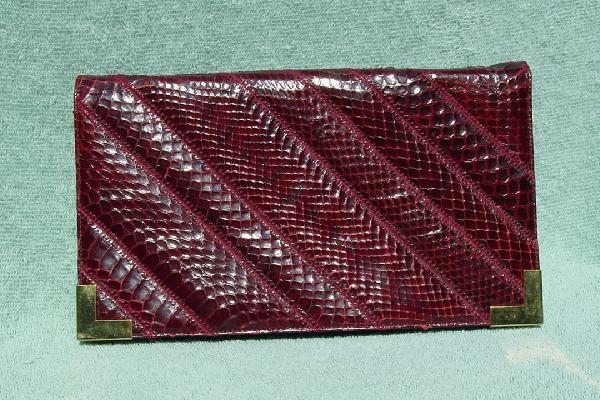 This vintage burgundy snakeskin and leather clutch has gold-tone L's on the bottom corners. The front and back are covered in snakeskin. It has a full front flap with a snap closure. 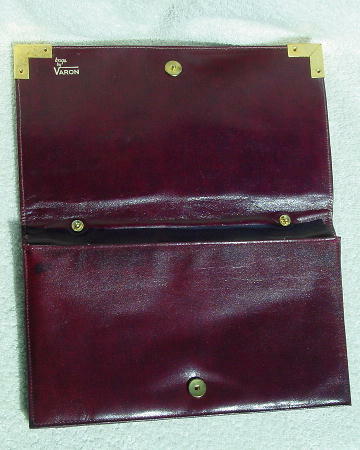 When you flip it open, there is soft burgundy leather on the inside of the flap, and on the accordion sides and front of the 3 inner yellowish fabric-lined compartments. In between the fabric-lined compartments are 2 small leather-lined ones. The rear compartment has an interior zipper section lined in gray fabric. There are 2 interior hooks if you want to put a chain on. A former model who now has several sons can't fit all the things she now needs to carry in it. She used it only on 2 special occasions and kept it wrapped. It was a Valentine's present she gave herself many years ago. She wouldn't tell whether she bought it in the '70s or '80s because she didn't want to give away her age. Wear it with your spike heels.